We are manufacturing a qualitative range of FAB media and all type of bio media Water and Waste Water Treatment Equipment. We are offering Bio Fab Media to our clients by our professional and expert technicians. 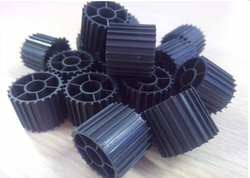 They are made of the polymer material and having high shock resistance power. We are provided the large space area for these products. They have consumed lots of energy with many adhesive shocks and cutting of bubbles. They are very easy to operate. We serve these products in different modules. Industries where this product is used: Where waste water is generated. we are a big manufacturer and supplied of MBBR media world wide.We are instrumental in providing our clients a comprehensive range of MBBR Media. Backed by adroit professionals, this media is manufactured using quality proven polymeric materials and innovative technology. Improves the enzymatic catalysis, this media is checked on varied quality measures so as to maintain its flawlessness. Furthermore, this medium can be availed in variegated sizes and designs, as per the requirements of our patrons.